The CDC Public Health Service officer at the Kentucky Department for Public Health and Dr. John Poe, KDH Veterinarian, have reported high levels of blue-green algae/cyanobacteria in some of central Kentucky’s lakes. When these occur, these are referred to as Harmful Algal Blooms or HAB. Today, the first report of a possible human case of a HAB-related illness describes a rash on someone who swam in Taylorsville Lake in north central Kentucky. In the last few weeks, the UKVDL has received several cattle with suspected blue-green algae poisoning. The cows were found acutely dead in or near ponds in which the blue-green algae Aphanizomenon and Microcystis were identified. Harmful algal blooms occur most commonly during the hot summer and fall months in stagnant waters containing excessive concentrations of nitrogen and phosphorus and other nutrients from fertilizer or manure contamination. 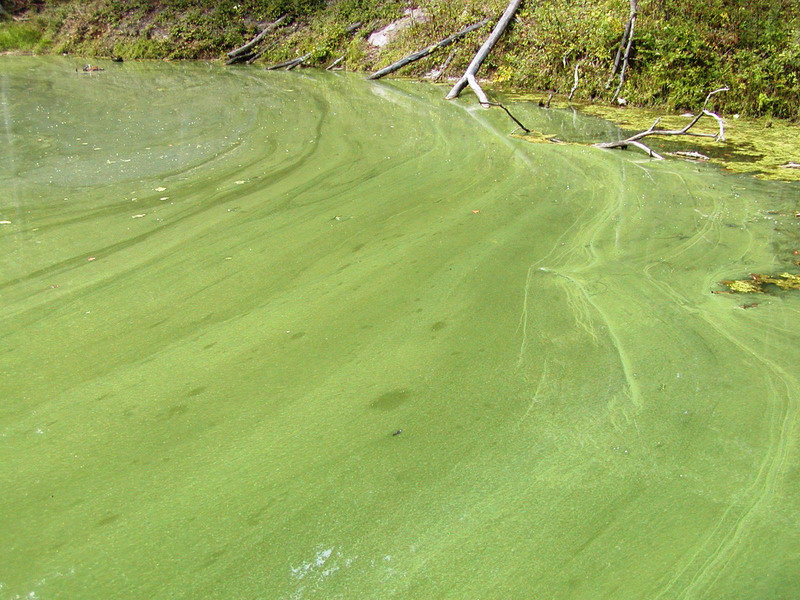 Under the right environmental conditions, blue-green algae can produce several major toxins. Some are potent neurotoxins causing muscle tremors, seizures, profuse salivation, dyspnea, diarrhea, and rapid death within minutes to hours. Others are hepatotoxins that can cause acute death or delayed death after signs of liver failure occur. Photosensitization can occur in animals that survive the acute stages of liver damage. In humans, skin rashes can also occur. Don’t swim in ponds/lakes that appear to have algal bloom. Restrict animals from ponds/lakes with algal bloom and provide fresh drinking water for livestock. Dead animals can be submitted to either the University of Kentucky Veterinary Diagnostic Laboratory or the Breathitt Veterinary Center for post-mortem examination. If blue-green algae intoxication is suspected, please also submit water containing green scum from the suspected water source. The CDC Public Health Service officer at the Kentucky Department for Public Health and Dr. John Poe, KDH Veterinarian, have reported high levels of blue-green algae/cyanobacteria in some of central Kentucky’s lakes. When these occur, these are referred to as Harmful Algal Blooms or HAB. Today, the first report of a possible human case of a HAB-related illness describes a rash on someone who swam in Taylorsville Lake in north central Kentucky.